Feeling toxic? Who isn't, with the huge increase in exposure to toxic metals, chemicals, pesticides and additives. If you are low on energy or struggling to lose weight, toxins could be the cause. Even if you follow the healthiest of eating habits and lifestyles, you will be bombarded by pollutants from food, water and air. So, is there any way to stop this toxic invasion? No, but you can do the next best thing, and move the toxins out of your body as soon as they enter. BODY DETOX CAN DO THAT FOR YOU! A build-up of toxins is all too easy to achieve. Chemicals in detergents, shampoos, deodorants, cosmetics and lotions enter through the skin. Small particles of air born pollutants enter the lungs. Food with chemicals, artificial sweeteners, pesticides and heavy metals easily pass into the intestines to invade the body. Chemicals are used through out your home in furniture, carpet, cookware, mattresses, bedding, cleaners, and so much more. 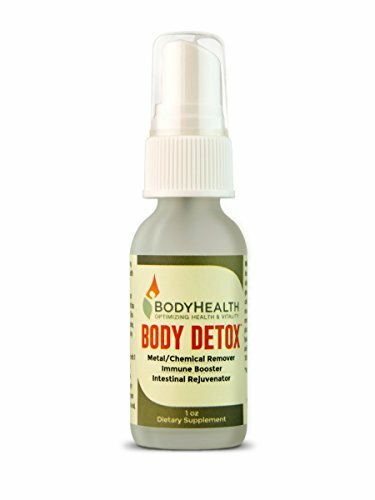 Body Detox comes to the rescue by binding toxins in the blood, and helping the body to eliminate them via the bile and out through the bowels. Body Detox also rejuvenates the intestinal flora, and helps to protect from the damaging effects of toxin-generated free radicals. Body Detox is best taken at bedtime on an empty stomach, followed by 6-8 ounces of purified water. It is recommended to start with 1-2 sprays, and gradually increase by 1-2 sprays each week to a maximum of eight sprays once daily (six for a child under age 5, four for a child under age 4, two for a child under age 2). A person who is very highly sensitive can even begin with one drop from a small eye-dropper (3-4 drops will equal one spray). If you have any questions about this product by BodyHealth, contact us by completing and submitting the form below. If you are looking for a specif part number, please include it with your message.